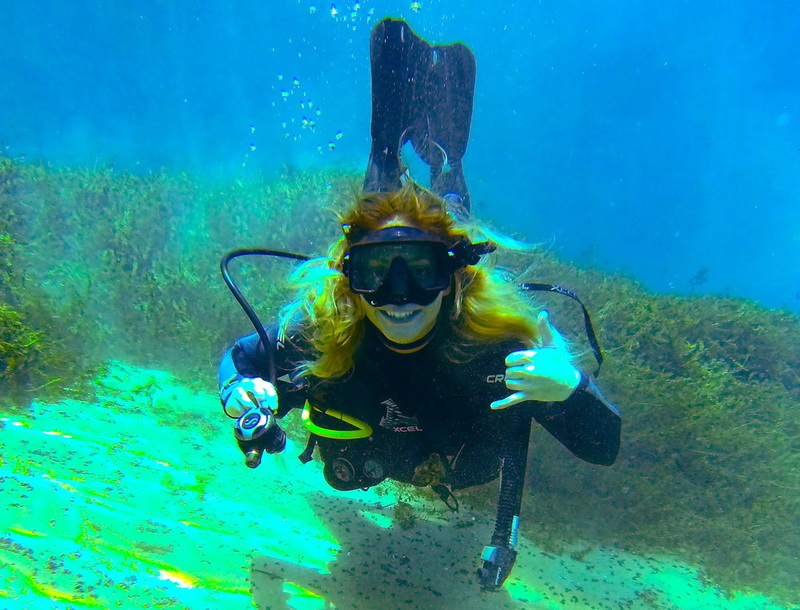 STONE CRABS, LOBSTERS ANd OTHER delicious REASONs TO LEARN TO SCUBA DIVE. For thousands of years Mankinds primary focus in day to day life was the gathering of food for survival. Here in the USA its nice that most of us have the convenience of driving down to the grocery store and buying whatever we want to eat. However, there is a price to be paid for no longer participating in the activities that drove mankind for thousands of years. We're missing out! Gathering one's own food is extremely satisfying and fun on a primal level that I can't even begin to put into words. 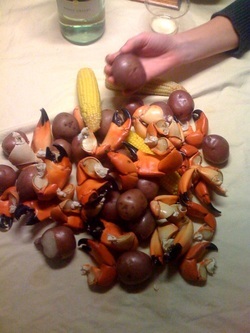 Take Stone Crabs for instance. Gathering stone crabs involves searching for their underwater burrows, which can be well hidden, reaching your hand into that dark hole, pulling the crab out and breaking off his larger claw if its of legal size. All the while taking care not to get your fingers pinched off (seriously, you tube it). After that you put Mr Crab back in his hole and his claw regenerates in 3-4 months. A renewable marine resource! This might sound insane but the payoff is worth it, Stone Crab Meat is the best there is, and when you know you got it your self, risking your digits, it's the most satisfying meal you will ever experience. Its illegal to posses the entire crab, you can only harvest the claw and that's cool because you don't have kill Mr Crab to still have an awesome meal! Technique is very important while handling these tasty little beasts and I was lucky enough to meet a great friend who grew up down here on the gulf to teach me how to do it. Anytime a group of humans go hunting and gathering together it's a primal, bonding experience that can forge new friendships and deepen existing ones. On the left is Captain Anderson Barnes, Sailing Instructor, Surfer, Boat Carpenter, Freediver, Scuba Diver and the person who taught me how to get stone crabs and mussels. A great friend with vast local knowledge. Scuba Diving and Free-Diving are not normally solo activities and its important to have a Buddy you trust and can rely on. My number 1 buddy is of course my wife, Mary. 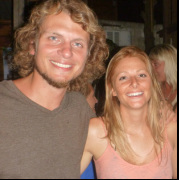 Ive spent more time diving with her than anyone else by far. She can spot camouflaged flounder and crab burrows better than anyone I know and I never come back empty handed from a trip if she's involved. 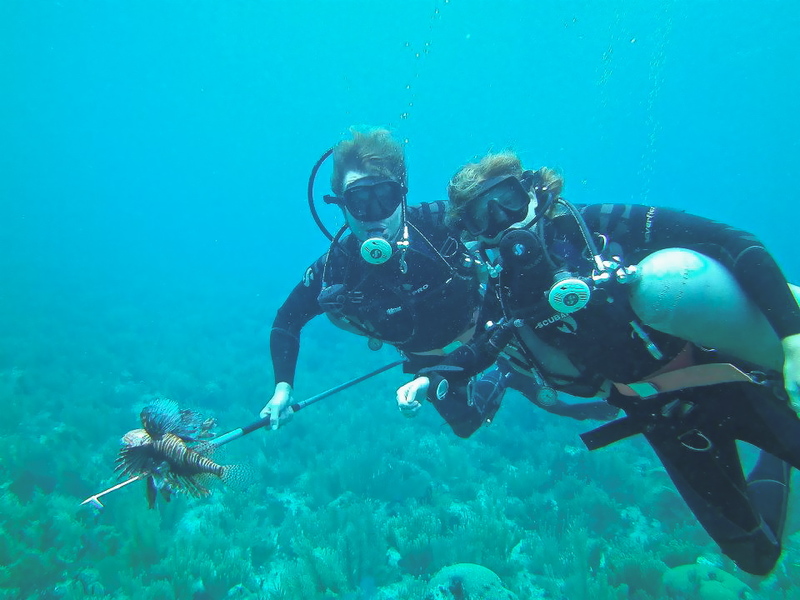 Diving with my wife, She spotted the lionfish and I speared it! Delicious Founder and unreal tasting Shovel Nose lobsters. The lobsters dont have claws or spines, you can just grab them. It's glorious! 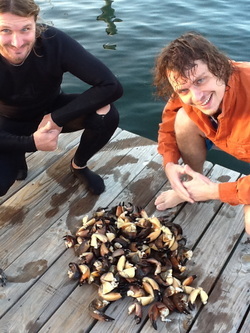 Me and my wife scored this particular assortment on a limestone reef off Panama City Beach in about 115 feet of seawater. I grilled the lobsters and baked the flounder, you really dont have to get fancy with it. Salt, pepper, butter and it taste so good you'll freak out! 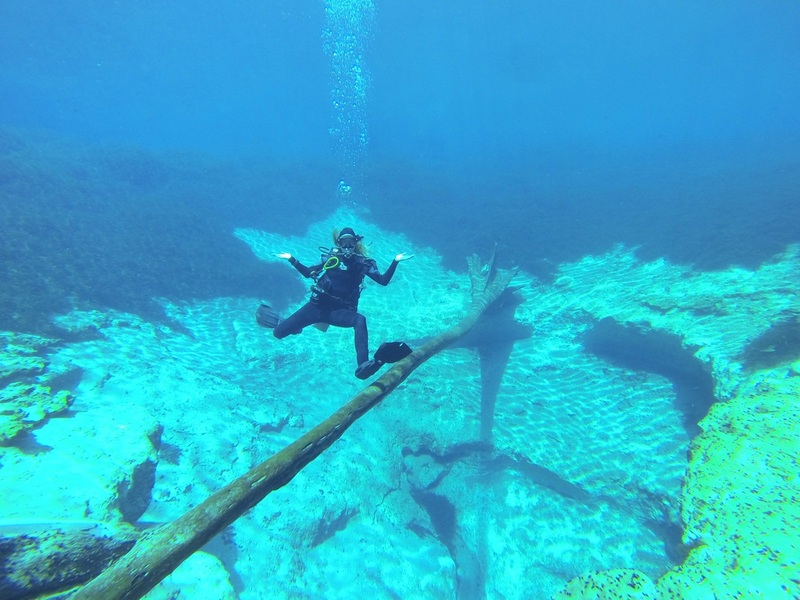 For a trip like this you need to get Get Padi Open Water Certified, Take a Deep Diver Specialty Class and it would be a good Idea to get Nitrox certified to for the extra margin of safety it provides. We can hook you up! 850-420-7118! why learn to scuba Dive? Well, I grew up in a nearly landlocked state but lucky for me I had a Grandfather with a huge pool in his backyard and a Father who would talk about Scuba Diving, Surfing & Spearfishing as the happiest, most profound moments in his life. This shaped my young malleable psyche into something that did not quite align with the aspirations of other young people my age and in my school. Try playing football when you're 32 years old, it hurts. Now try scuba diving, markedly less painful and you get to experience a state of existing that you otherwise never would. Did any of you want to become astronauts? 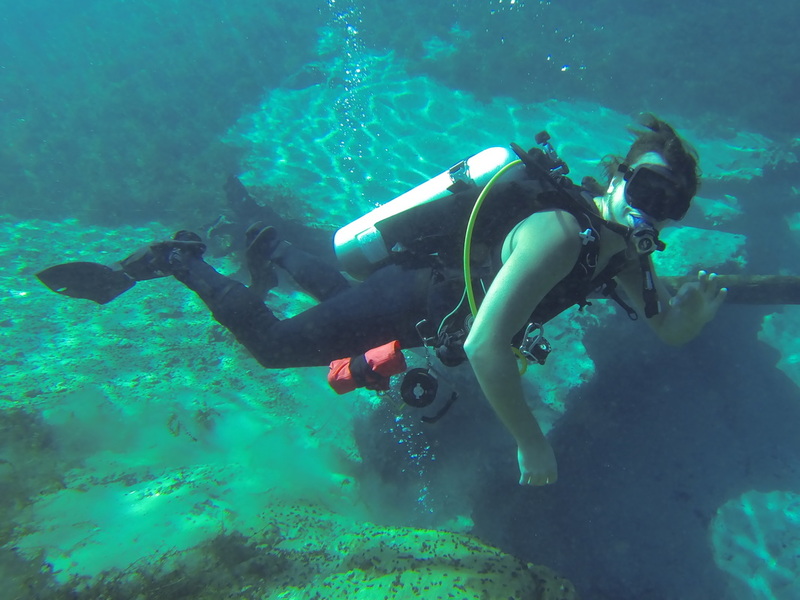 It is easier and much more fun and quite a bit less expensive to just become a scuba diver. We know less about our own oceans than we do about outer space. 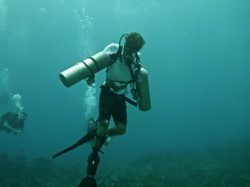 With scuba you can enter a different atmosphere, breathe in it, thrive in it, be weightless in it. You think about nothing in this new environment because so much new information is bombarding you. Your mind starts to clear and you feel better. I have never been able to meditate or clear my mind except when Im scuba diving, freediving, hunting or surfing. I described this to a Doctor and he told me that the reason I can clear my mind during these activities, is that all of those activities force you to focus intensely on the present and ignore the constant bombardment of thoughts and stimuli that we are normally subject to. I have found this to be true. So, give yourself a break from gravity and your land existence and come breathe underwater with us for a little while. I promise you wont be sorry you did.